Technical prowess is at the core of being a true shredder, and this book will help you build and maintain the monster chops you need to shred with the best of them. Develop your speed and fluency with picking, arpeggios, intervals, tapping, sweeping, and a variety of legato techniques. Choose one workout from each section every day, and your technical development will accelerate beyond your wildest dreams. On the video, German "Lightspeeder" Schauss demonstrates each example with accuracy and speed while clearly explaining his approach in a friendly, accessible style. Through the mastery of extreme metal technique, you'll be able to bring the music that's in your head to life on the guitar---without limitation! Classically influenced shredder German Schauss has taught at Berklee College of Music and LA Music Academy. He endorses Parker Guitars, Bogner Amplification, DiMarzio, DR Handmade Strings, Dunlop, PreSonus, Native Instruments, and Morley. A composer, performer, and educator, Schauss is a five-time recipient of the ASCAPLUS award. 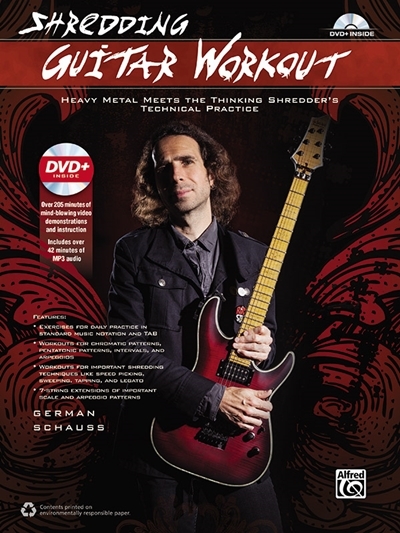 The July 2008 issue of Guitar World magazine listed Schauss as one of the fastest guitarists of all time.